Over time, sun exposure and aging cause your to lose its youthful glow and show sun spots, fine lines, and rough texture. Some of these changes come from damage to the top layer of skin while other changes come from damage to the collagen under the skin. Previous lasers couldn’t effectively treat all of these problems because the laser targeted either the top layer or the collagen layer. This meant you had to have multiple treatments with multiple lasers to really get the job done. Halo by Sciton is the world’s first and only hybrid fractional laser. 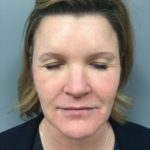 This exciting new laser technology combines an ablative laser that targets the top layer of skin and a non-ablative laser that targets collagen to deliver precise results with fewer treatments. 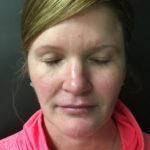 The most exciting feature is that combining these two lasers into one treatment actually reduces downtime. 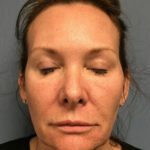 Moreover, each laser can be tuned to your specific needs so your treatment is customized based on their skin’s unique needs and the desired downtime. In the past, you had to choose between a procedure that offered really great results but required a lengthy recovery, or a procedure with a fast recovery but marginal results. Now with Halo you get the best of both worlds: great results with minimal downtime. Halo combines deep dermal rejuvenation with epidermal renewal for a combined synergistic effect you can’t get with any other treatment. Halo creates beautiful results without the downtime of more aggressive treatments. Everyone working here receives this treatment once a year. Most patients are entirely fine going back to work the very next day (Day 1). 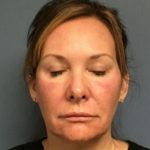 You can wear makeup and/or sunscreen immediately, if desired. The series of pictures below show a Halo treatment on one of our staff. 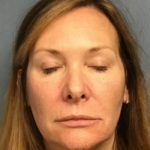 The first pictures shows what she looked like immediately after treatment and the next 4 show how she looked every day afterwards. These next pictures show the same thing on another staff member. 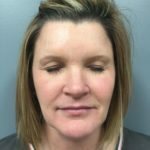 The Halo hybrid fractional laser can repair the visible signs of aging as well as brown spots, fine lines, enlarged pores, and uneven skin tone. It provides deep dermal rejuvenation by stimulating the replacement of damaged collagen with new, healthy collagen. The result is improved skin texture with a more youthful appearance. With a topical anesthetic and integrated cooling technology, most patients experience very little discomfort. Most patients describe the treatment as a feeling of heat with occasional prickling sensations, but are generally comfortable. After the treatment, most patients will continue to feel warm for an additional 15-30 minutes for lower-level treatments and up to 2 hours for aggressive treatments. Halo eliminates years of damage by precisely targeting the right depth. Halo restores the luminous glow you had when you were younger. HOW SOON AFTER MY TREATMENT CAN I RETURN TO NORMAL ACTIVITIES? For the first 24 hours you should keep your skin protected, but after that you should be able to go about your normal activities. Not in the way that most people think. Immediately after Halo treatment you can apply sunscreen, makeup, and moisturizers. After three to five days you will develop a light bronzing appearance and by day four to seven your skin will “peel” but the peeling with Halo typically comes in the form of small coffee ground-like grains that rise to the surface. 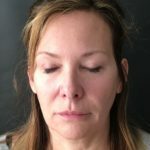 These grains are the sun-damaged, broken, and functionally worthless collagen that Halo treatment is removing from your skin so that it can be replaced by new, healthy collagen. 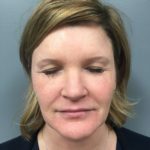 You will see initial results between two and five days after your Halo treatment, but your skin will continue to improve over time. 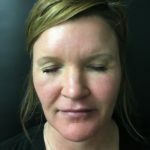 Most patients see the greatest pigmentary improvement in the first two to three weeks. This is followed by a dermal regeneration phase that continues to improve for months. Your Halo results will last for years to come, but you should continue to keep your skin protected at all times using UV sunscreen to protect your new, healthy skin. In the future, each additional Halo treatment improves the results, giving you even better looking skin.